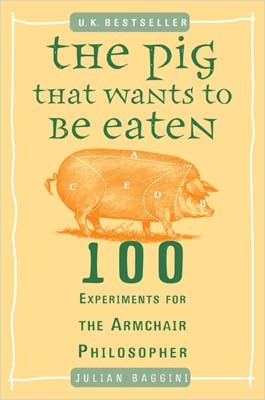 As the subtitle suggests, this book contains 100 thought experiments for the armchair philosopher. Who are the armchair philosophers? I guess Baggini was referring to those so-called philosophers who never got up from their armchairs. They just daydreamed all day in their armchairs without wandering into the real world. However, this is the main job for philosophers; they question the existence of reality, among many other things. Each experiment is a one-page story, describing a scenario which presents a dilemma of choice. It is followed by a short explanation by Baginni on the philosophical point. The 100 stories cover a wide range of philosophical topics, modified from themes proposed by Plato, Descartes, Hume and many others. At first I thought the book would be like Zen stories which try to outwit the readers. However, this book is just meant to provoke thoughts without actually deciding on rights and wrongs. As expected of a book on philosophy, there are quite a number of stories on religions, or what is wanting of them. The stories are varied. So I just first make a note on the famous pig. Max was a vegetarian for forty years. He refused to eat meat owing to his principle against cruelty to animal. He just met Priscilla who was a genetically modified breed pig. Priscilla was now intelligent. She knew her fate and took the ultimate end of feeding the human by her flesh as the highest goal in life, i.e. she was too pleased to be eaten; not being eaten would be a great failure. Not only that, her intelligence evolved to the state that she was able to communicate to Max and told him her lifelong wish. There was also a chicken with no name and very little brain, being genetically modified to be unable to feel anything around it, including awareness of self, environment, pain or pleasure. It lived the life of a vegetable. Its life was just growing up and then being plucked like a carrot to be cooked for food. Max was happy that he was able to eat meat again knowing that there would not be anything cruel done to his food before cooking. As Max picked up the knife and fork, there was a strange feeling. What was the difference of this plate of meat from that he refused to eat yesterday? Were they different because they were smarter or dumber? You may wish to explore the other ninety nine interesting stories yourself.